Stealing Nasreen is Torontonian author Farzana Doctor’s first novel, but the second book I’ve read by this interesting combination of psychotherapist and writer. I read and reviewed Doctor’s Lambda award winning second novel, Six Metres of Pavement, last summer. I really liked Six Metres, but my review took an interesting and critical turn because of expectations I had about the novel because of its win in the lesbian fiction category (in short: I ended up having a frustrating reading experience, because the novel is mostly about a straight couple, with a secondary queer [not lesbian] identifying character). Given how the Lambda’s categorization of Six Metres had coloured my experience reading Doctor’s second book, I was eager to pick up Stealing Nasreen with an open mind and minimal expectations. I’m glad to say that I had a much more enjoyable encounter with this book, which is some ways is quite similar to the one I read last summer. I wish I could have read Six Metres in such an intellectually relaxed environment! Both novels centre around three characters, their intertwined relationships, and the emotional impacts they have on one another. 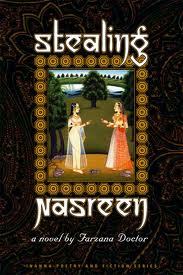 Stealing Nasreen, however, devotes pretty much equal time to each of its main characters, in contrast to Six Metres, which focuses on the straight male character and branches off from there. One of Stealing Nasreen’s characters is, of course, Nasreen, an Indo-Canadian woman in her thirties who is a lesbian and psychotherapist. Another is Salma, in her late thirties and a former teacher and married mother of two who has been living in Canada for two years after having immigrated from India. Her husband, Shaffiq, is a former accountant who has finally taken a job as a janitor in a Toronto hospital because he has been unable to find work in his field. Doctor deftly and smoothly fleshes out each person’s life, which, as the novel progresses, becomes more and more enmeshed in the others’. One of the strengths of this book, as with Doctor’s more recent novel, is the skill with which she paints the complexities of these different characters’ emotional interior landscapes. They are intricate, fascinating, and authentic characters. 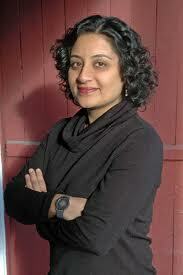 Embracing complexity, in fact, is something Doctor does throughout the book; the way that she deals with the immigrant’s dream, multiculturalism, religion (all three characters come from Muslim backgrounds, although none are particularly devout), desire, family, and queer politics is never simple. There’s a clear bent toward inevitable contradictions, a refusal to ignore the hypocrisies and the gray areas that give the novel a philosophical feel at times. What I mean is that it makes you sit down and think about the complexities of humans and their relationships with each other. It certainly did with me, anyway—making me think about past relationships in a way that I hadn’t in some time. This book is about a love triangle of sorts, but in many ways it’s not the kind you expect. In a way, both Shaffiq and Salma have a ‘crush’ on Nasreen, but their feelings are, in fact, pretty different. For Shaffiq, Nasreen represents something that both terrifies and intrigues him: she is Indian and Canadian, a vision of what his daughters might grow up to be after living in Canada. She’s familiar and radically unfamiliar, westernized in a way that is very foreign to him, especially when it comes to her openly queer sexuality. Salma’s feelings for Nasreen are more explicitly crush-like, but they have more to do with Salma’s struggles to reconcile her previous lesbian relationship in India and her unhappiness and loss of independence in Canada. For her part, Nasreen ends up in the middle of this marriage at a pretty tumultuous time in her own life: she’s recently broken up with her partner and is still grieving the loss of her mother to cancer two years ago. At first, Salma and Shaffiq don’t realize they have both met the same woman: Shaffiq works at the same hospital as Nasreen, and Nasreen has started taking Gujarati language lessons from Salma. Of course, this precarious situation comes crashing down eventually when they all find out about the tenuous connections between them. I’d be lying if I said I wasn’t a little disappointed that, in the end, Salma stays in her marriage. It’s not that I begrudge her being in a relationship with a man; it’s more that I felt sad that she stayed in the marriage when it was a relationship that had really taken a lot of her independence and her life’s passion: teaching. I suppose this ending is ‘realistic,’ but maybe that makes me even more sad? That said, the exploration of the complexities of queer experience and how Salma’s sexual identity and orientation are shaped by the time and place in which she is born and grows up is very well done. I really appreciated that she was depicted as more than a simple lesbian-forced-to-marry-a-man-she-doesn’t-love. She loves her husband, but she also loved another woman before him. While her past (and present) attractions to women don’t define her sexuality, neither does her present marriage to a man. The novel does a great job of examining just how different queer experiences can be. Nasreen and Salma are figuratively and literally worlds apart: Nasreen can’t understand why Salma can’t let go of her fear of queerness and Salma knows that Nasreen will never be able to understand what it was like to fall in love with a woman in late 1970s Bombay. This is an impressive book, especially for a first novel. If you haven’t checked out Farzana Doctor’s writing yet, pick up a copy of Stealing Nasreen and Six Metres of Pavement! This entry was posted in Bisexual, Canadian, Farzana Doctor, Fiction, Lesbian, Postcolonial, Queer, South Asian, Toronto and tagged books, Inanna Publications, lambda award, literature. Bookmark the permalink.